How do pacemakers regulate arrhythmias? What should I expect during pacemaker surgery? What should I expect after pacemaker surgery? A pacemaker is a small device that's placed in the chest or abdomen to help control abnormal heart rhythms. This device uses low-energy electrical pulses to prompt the heart to beat at a normal rate. Pacemakers can relieve some arrhythmia symptoms, such as fatigue (tiredness) and fainting. A pacemaker also can help a person who has abnormal heart rhythms resume a more active lifestyle. Doctors also treat arrhythmias with implantable cardioverter defibrillators (ICDs). ICDs are similar to pacemakers. However, besides using low-energy electrical pulses to control abnormal heart rhythms, ICDs also can use high-energy electrical pulses to treat certain dangerous arrhythmias. Doctors recommend pacemakers for a number of reasons. The most common reasons are bradycardia and heart block. Bradycardia is a slower than normal heartbeat. Heart block is a problem that occurs with the heart's electrical system. 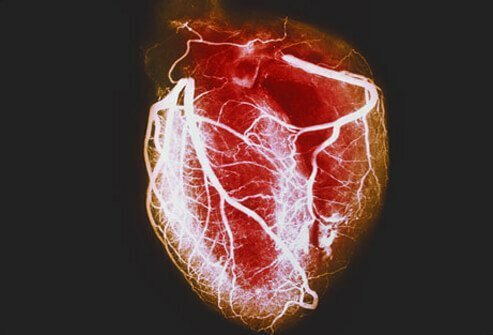 The disorder occurs when an electrical signal is slowed or disrupted as it moves through the heart. 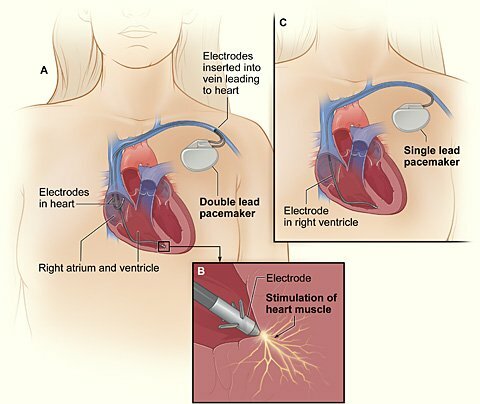 A pacemaker consists of a battery, a computerized generator, and wires with sensors called electrodes on one end. The electrodes detect your heart's electrical activity and send data through the wires to the computer in the generator. If your heart rhythm is abnormal, the computer will direct the generator to send electrical pulses to your heart. The pulses then travel through the wires to reach your heart. Placing a pacemaker requires minor surgery. The surgery usually is done in a hospital or special heart treatment laboratory. You'll be given medicine just before the surgery that will help you relax and may make you sleepy. The surgery takes just a few hours, but you'll stay in the hospital overnight so your health care team can check your heartbeat and make sure your pacemaker is working properly. Complications from pacemaker surgery are rare. Most people can return to their normal activities within a few days. Your doctor may ask you to avoid vigorous exercise or heavy lifting for about a month after your surgery. After you have fully recovered from surgery, discuss with your doctor how much and what kinds of physical activity are safe for you. Let all of your doctors, dentists, and medical technicians know that you have a pacemaker. Your doctor can give you a card that states what kind of pacemaker you have. Carry this card in your wallet. You may want to consider wearing a medical ID bracelet or necklace that explains that you have a pacemaker. Your doctor will want to check your pacemaker regularly. Some pacemaker functions can be checked remotely through a telephone call or a computer connection to the Internet. Your doctor may ask you to come to his or her office to check your pacemaker. Pacemaker batteries last between 5 and 15 years (average 6 to 7 years), depending on how active your pacemaker is. The wires of your pacemaker also may need to be replaced eventually. Your doctor can tell you whether your pacemaker or its wires need to be replaced. How are abnormal heart rhythms (arrhythmias) diagnosed? The image shows a cross-section of a chest with a pacemaker. Figure A shows the location and general size of a double-lead, or dual-chamber, pacemaker in the upper chest. The wires with electrodes are inserted into the heart's right atrium and ventricle through a vein in the upper chest. Figure B shows an electrode electrically stimulating the heart muscle. Figure C shows the location and general size of a single-lead, or single-chamber, pacemaker in the upper chest. How often do pacemakers need to be checked? How long do pacemaker batteries last? NIH. "Pacemakers." Updated: Feb 28, 2012. Do you or a relative have a pacemaker? In what ways has it changed your lifestyle? Describe what surgery is like to receive a pacemaker. What type of pacemaker do you have? Were you worried about the risks of pacemaker surgery? An implantable cardiac defibrillator is a device that is inserted into the chest to prevent sudden death from an irregular heartbeat. If the heart develops a life-threatening tachycardia (rapid heart rate), the device administers an electric shock to restore normal rhythm. Cell phones, MRI scanners, metal detectors, and certain heavy-duty electrical powered equipment may interfere with an implantable cardiac defibrillator.